Willie the kitten is a lucky lil' fellow. He was stuck in a storm drain in Savannah, Georgia when 3 women heard his cries for help. As reported by WSAV, the women called Animal Control but they were told it would be some time before the rescuers would arrive. The women tried to rescue the kitten themselves but the storm drain was too heavy to lift. Then all of a sudden a man pulled up in his car. He volunteered his assistance. Willie's saviour pulled up the storm drain and jumped in and pulled him out. Linda Elliott, one of the office workers, asked his name. He said he was "Willie." So Linda named the kitten after him. And now Willie the kitten is living with her. 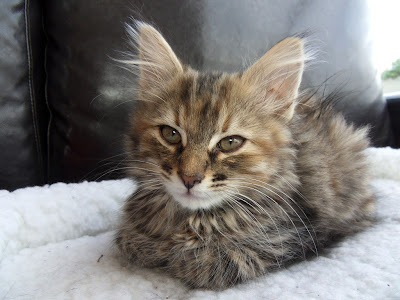 photo credit of kitten (not Willie): Jennifer C.
It's a lovely story! Yay for Willie!!! AWWWWWWW!! Willy is one lucky kitten! And VERY cute. awwww - yeah for those ladies and for GENTLEMEN who stop to help!!! Lovely! Hooray for Willy. He got rescued and a new name AND a new home. He's sooo cute, too. Brings out the mommy in us all (and the daddy in Willie the human). Wonderful uplifting story! My, my, there are nice people like us out there who love animals! I just LOVE a happy ending. Thanks to all those peeps who helped little Willy. He's a cutie! What a handsome lil fellow he is! And what kind people to help him during his difficult time.